Superman: Red Sun by Mark Millar | Stevie is a writer. The concept got me reading and the art kept me from putting it down, but the story was a bit lacking. A comic that answers the question of what if Superman had landed in soviet Russia instead of Smallville, Kansas? This is my first real Superman comic, to be honest I was a bit disappointed with the story. I feel like they could have gone much farther than they did. view on communism that was slightly positive, not in a way that the author agreed with it but in the way that Superman was a true image of it rather than a man who went to far and discovered the errors of his ways. Because of this I think the story really fell flat in several places, unfortunately. It was an interesting enough story, it just didn’t hold my attention or make me want to know how it all ended. 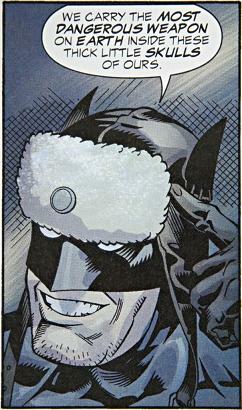 However, can we take a moment to talk about the gloriousness of Batman’s hat? Truly it is with the artists reinterpretations of our beloved superheroes thatmakes this comic shine in my eyes. Especially when it comes to Batman, I mean, just look at his hat. So epic. I wants one. This entry was posted on July 11, 2012 by Stephanie. It was filed under Comic Book Review and was tagged with communism, smallville, soviet russia, superheroes, superman comic.